The folks at SousVide Supreme just introduced a chamber vacuum to their product lineup. 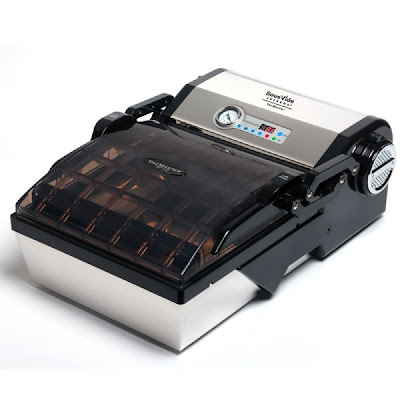 Given the name of the chamber vac is the SousVide Supreme VacMaster® VP112 chamber vacuum sealer , it appears to be a SousVide Supreme branded version of the VacMaster VP112 (possibly the dumbest sentence I have written this month). The price point is $799 (Which is list price for the VP112), but a quick Google Search reveals prices as low as $650, for the non branded VP112. ps: Will have more to say later. pps: Buyer beware at that 650$ link. They have good ratings from Google, but I have never heard of them. While you may not have heard of us, we have been online for years and we pride ourselves on giving excellent deals and even better customer service. If you are concerned and want to learn more about us, you can click on the Better Business Bureau link on our site to ratings or you can call us and find out for yourselves. You won't be disappointed. Great price. Thank you for writing in. I can vouch for QualityMatters.com. I hadn't heard of them either, but ordered a VP112 and it arrived today. The product was on backorder for a few weeks (so were many other places too, so I knew when I ordered from QM). I was informed promptly about the status and was kept informed. Last week I received an email letting me know their supplier had shipped units to them and that once received, mine would be shipped. Pricing was good and service has been pleasant. Now to see how the VP112 works and holds up. I also ordered from qualitymatters. they are willing to pricematch online vendors also. Look around..they gave great service.